KÖNIG GALERIE is pleased to present new works by Danish artist Jeppe Hein, in conjunction with the grand opening of its new location at the historic St. Agnes Church. 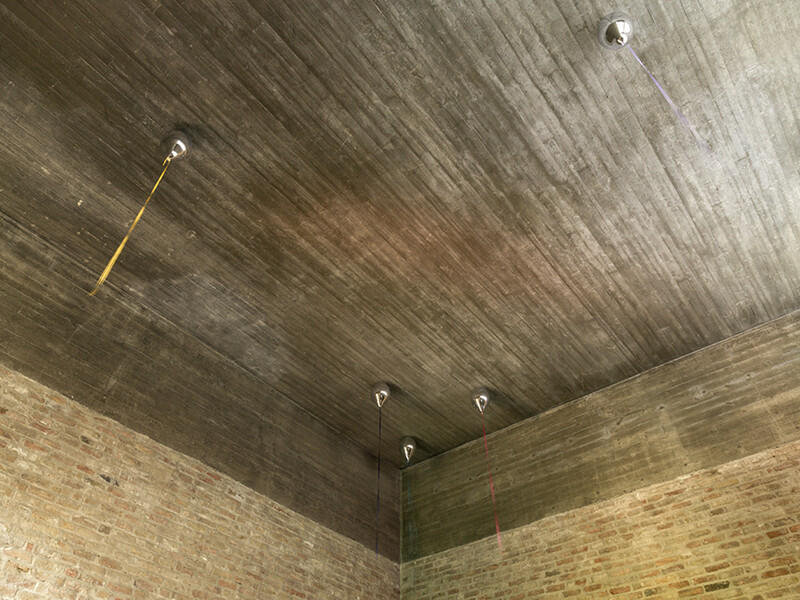 On view in the downstairs space of the gallery, the former chapel Marienkapelle, is "Mirror Balloons VII" (2015), a series of seven balloons that linger against the ceiling, warping the viewer’s perception and distorting the surroundings in their reflection. Rearranging visual hierarchy in the room by occupying its highest limits, chromed balloons move subtly with the circulation of the air, hanging above the heads of the spectator. Hein’s practice engages interactively with his viewers, drawing them in as the center of the work, and essentializing their presence as an integral component of the work’s existence and function. Here however, the sculptures’ motion is more gentle and natural than Hein’s previous works: it is only the force of air, caused by the circulating bodies of the crowd below, which catalysis its soft motion. On the surface, the objects’ curves create an optical fisheye to visually warp our bodies. The use of humor is central to Hein’s oeuvre, and it is with sly playfulness that he investigates the symbolic cues of the ubiquitous balloon: a child’s plaything, a party decoration, a commonplace backdrop to social gatherings and celebrations. Such a quotidian item is so prevalent it might seem to be almost empty of meaning, or appear to be both metaphorically “full of air”, save for our own reflection as it occurs on its smooth contours. 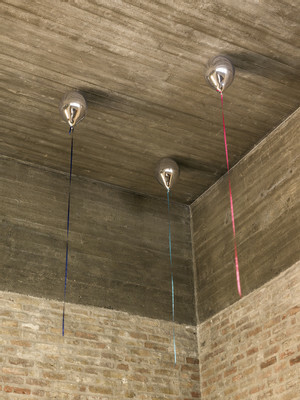 Whereas balloons commonly uplift the mood of a setting, in an interesting reversal it is we who prescribe mood onto the object, as we witness ourselves and the space in which we stand. This installation seems to be contained only by the roof, tempting us with the suggestion that they would soar away into the infiniteness of the exterior. Their long strings ask for a hand to pull them down, and yet they remain in their place, lingering between us and the rest of the world. There is a narrative playing out in its metaphor. In what kind of a moment were they released? Was it accidental? 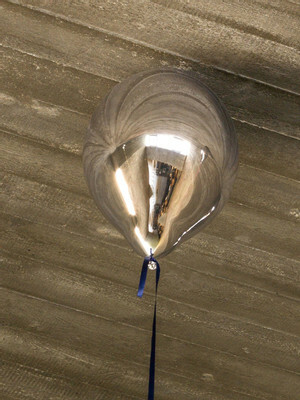 The lifespan of a balloon is both fast and fragile – as it floats up, it will soon return back to the ground. And so we witness this short time in between its ephemeral yet certain cycle, and as such we witness ourselves, in this delicate instant of time and place, at an intersection of sight and thought. Jeppe Hein (*1974 Copenhagen, Denmark) lives and works in Berlin. Since studying at the Royal Academy in Copenhagen and Städelschule in Frankfurt/Main (1997-1999) he has been part of numerous group exhibitions and has realized several works in public space. In November of this year, he will open a solo show at Kunstmuseum, Wolfsburg, Germany. Recent exhibitions include “A Smile For You” (2013) at Bonniers Konsthall, Stockholm and Wanås Konst, Sweden; “Robert-Jacobsen-Preisträger” (2012) Museum Würth, Bad Mergentheim, Germany; “360?” (2011) at the 21st Century Museum of Contemporary Art, Kanazawa, Japan; “1xMuseum, 10xRooms, 11xWorks” (2010) at Neues Museum Nürnberg; Distance (2010) at IMA - Indianapolis Museum of Art, Indianapolis; “Sense City” (2009) at AroS Museum of Art, Århus, Denmark. His works are parts of institutional collections such as the Tate Gallery, London; Centre Pompidou, Paris; Museum für Moderne Kunst, Frankfurt/Main; Museum of Contemporary Art, Los Angeles.